Telecommunications carriers need to start selling value-added services or watch their margins and markets disappear, market analyst Gartner says. Gartner said 15% of mature telcos' revenue should come from non-traditional sources within five years. These include selling music, video and other downloads, as well as advertising and application services based on what they know about their customers. Offering payment systems would be a natural adjunct to these, said Jean-Claude Delcroix, a Gartner research vice-president. He said the technologies that provide and manage the physical networks are converging with those that provide content and services that run on the network. This was a chance for telcos to offer services such as consolidated office applications, including diary co-ordination, at lower prices. Delcroix expected to see fixed and mobile network operators joining forces to provide such offerings. This was so that users could access their personal data and services from anywhere. He said there are security, privacy and access issues to overcome, as well as regulations that encourage market diversity. "Telcos cannot afford to be simplistic," he said. "They must develop a more sophisticated approach to regulations, to competition and to customers." Customer profiling of the type suggested by Gartner has proved highly controversial. 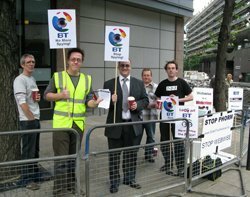 The European Commission has asked the UK information commissioner to justify allowing BT to test the Phorm user profiling technology. Delcroix said the issue was overblown. "Telcos do not know as much about their customers as Google or FaceBook know about theirs," he said. Gartner called for regulators to allow telcos to compete on level terms with search and social network firms. Delcroix said many political, regulatory and civil society organisations would like to see carriers and ISPs stop transmission of undesirable and/or illegal material. Five UK ISPs agreed last month to send "cease and disist" letter to users who share files illegally. In the past carriers have argued that they are not responsible for the content of messages. Delcroix said they would be more likely to "act as policemen" if they had a financial incentive, such as protecting copyrights that they owned or licensed.